On September 14, 2010, the Russian president celebrated his 45th birthday . It was his third birthday as president, and he, most certainly, had received dozens of phone calls from high-level officials and foreign counterparts over the past years. In 2010, however, wishes and congrats poured in from all over the world, in their hundreds, from… Twitter ! Medvedev started his Twitter account last June, while visiting Silicon Valley . He has two officially verified personal accounts: @KremlinRussia  (tweets in Russian) and @KremlinRussia_E  (tweets in English). There is also the @blog_medvedev  account, which simply relays the President's blog post updates. As September 14 progressed, the “word” of Medvedev's birthday got viral, prompting many to express their wishes and words of advice. 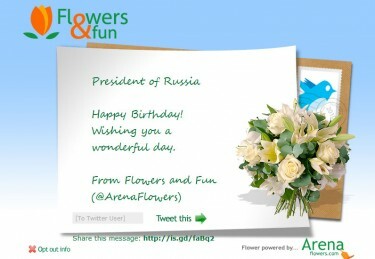 Thanks to Twitter, I know that our President, @KremlinRussia has a birthday today! And who said this is a useless website? I'm still on time to congratulate you on your 45th Birthday, Dmitry Anatolievich @KremlinRussia! I wish you one second term as President. Good luck! Happy Birthday, Dmitry Anatolievich. New approaches to work, that you are successfully implementing, are vitally important for Russia! 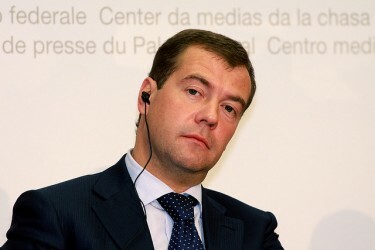 The Russian Brussels congratulates President D. A. Medvedev on his anniversary! We are waiting for your visit! @KremlinRussia when I was 25, I thought 35 will be the end of life. Now, when I'm 35, I realize that 45 is the time for grand achievements ;) Happy Birthday! Sincerely! Thank you all for the congratulations. It's very nice. Honesssly! ‘Honestly’ is written with a ‘t’ RT @KremlinRussia Thank you all for the congratulations. It's very nice. Honesssly! President's press office: closer to the peoppple RT @KremlinRussia Thank you all for the congratulations. It's very nice. Honesssly! @KremlinRussia, can't make it without mistakes? Or is it supposed to be cool? On the post-celebration morning must certainly ask @KremlinRussia for anti-hangover recipes! Certainly, a great illustration of the increasingly horizontal flows of communication, both within Russia as well as internationally. A more or less direct interaction with thousands of individuals is gradually becoming the norm and, as shown, seems to be working fairly well. It was particularly interesting to observe the public diplomacy element of it, since the news spread in the Tweet-o-sphere and reached many around the world. After all, successful communication strategies that use social media are striving to achieve just that.